Part March Madness. Part martial arts. Part bragging rights. Mostly, a morale boost for Marines in theater. 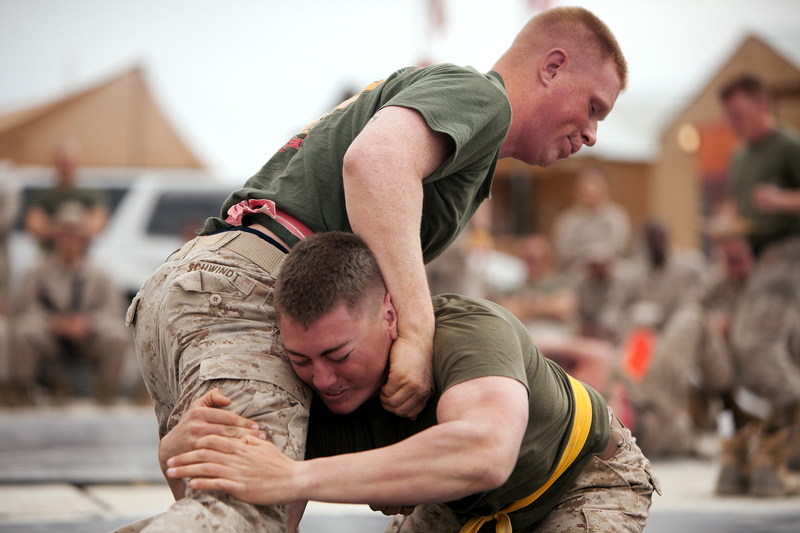 Marines assigned to Combat Logistics Battalion 1, 1st Marine Logistics Group, took out some war-zone stress and showed off their martial arts skills the last two Saturdays, competing in a ground-fighting tournament that organizers hope will build camaraderie within the unit. Check out a full write-up and some more pics, all by Cpl. Alfred V. Lopez, here. According to the piece, the combatives exercises are just a part of the pseudo-Olympics set up by CLB 1. They’ve already had football, soccer and volleyball events, and they’re planning a strongman competition — probably without the keg toss or the refrigerator-strapped-on-your-back race, but you can’t rule anything out. CLB 1 is on a seven-month deployment in Helmand province that began in late September. Always bet on the guy whose last name is Silva. That kid lcpl silva looks like a animal! I have to get him in the ufc.